MediaMath’s comprehensive APIs empower users of the TerminalOne Marketing Operating System™ to programmatically access and modify their campaigns, reports, and log data. T1 Account is necessary to make API calls. If you do not have a T1 account, please contact our sales and partner integration team. This documentation is geared to those who already have a familiarity with MediaMath’s TerminalOne platform. For more information, please review the MediaMath T1 Knowledge Base. Be sure to visit our Engineering Blog to read the latest and greatest from the MediaMath engineering team. Subscribe to our list for release notes and changes. Got a question? Reach out to us via developers@mediamath.com, or the support chat button. OAuth2 Authentication — OAuth2 authentication allows Clients to access User data without handling secure credentials. Campaign Management — View, create, and update all campaign-related entities in TerminalOne using our REST API. 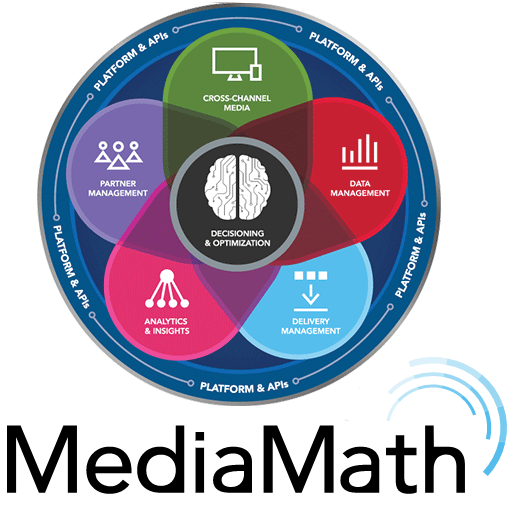 Bring Your Own Algorithm — Apply your own bidding algorithms within MediaMath’s brain. Reports API — A simple and flexible way to access human- and machine-readable reports about the entities available in TerminalOne. Log Level Data Service — The Log-level Data Service (Logs Service) enables advertisers to access the raw, event-level data generated through the TerminalOne platform in a tool-agnostic way. Adaptive Segments — Construct audience profiles using existing event pixel and campaign impression and click data without needing to place additional tags on your site. Audience Segments — Create and manage permissions around custom audiences. Lookalike Modeling API — The Audience Modeling API allows users to communicate with the modeling platform to create models, retrieve model information, view the status of pending models, and find countries that support the functionality. API access also enables users to make bulk model requests. Marketplaces — PMP Direct and Exchange allows advertisers to bring supply directly into T1 to create preferential-access inventory. Mediamath also provides SDKs to engineering teams who wish to intergrate with the T1 Marketing Platform. Thank you for using the TerminalOne™ platform application program interfaces (the “APIs”). We provide these APIs to allow you to build integrations, applications and custom tools (collectively, “Applications”) that help you use the TerminalOne™ service platform (the “Service Platform”) and the services available therein. Your use of (i) the APIs and (ii) any API related documentation, software and materials provided or made available to you by MediaMath (collectively, the “API Materials”) is subject to and must comply with these terms (referred to herein as the “Terms”). By accessing and using the API Materials, you acknowledge that you have read, and agree to these Terms (your agreement to the Terms referred to herein as the “Agreement”). If there is a conflict between these Terms and additional terms applicable to a given API, the additional terms will control with respect to that conflict. We reserve the right to revoke your license and access to the APIs without notice if your use of the APIs violates any of these Terms or if we otherwise object to your use of the APIs. Account and Registration (a) Your Access Codes are Confidential Information (defined below). You may not sell, transfer, sublicense or otherwise disclose your Access Codes to a third party. You are responsible for maintaining the confidentiality of your Access Codes. If you become aware of any unauthorized disclosure or use of your Access Codes, you shall immediately notify MediaMath. (b) MediaMath may grant or revoke an Access Code for any reason in its sole discretion. © Access Codes are personal to you. You are responsible for maintaining the secrecy and security of your Access Codes. You shall be responsible for all activities and actions that occur using your Access Codes. (d) You may not use the API Materials and may not accept the Terms if you are not of legal age or otherwise unable to form a binding contract with MediaMath, Inc. (“MediaMath”). (e) If you are using the API Materials on behalf of an entity, you represent and warrant that you have the authority to bind that entity to these Terms and that by accepting the Terms, you are doing so on behalf of that entity (and all references to “you” in these Terms shall include that entity). (f) In order to access the API Materials, you must provide certain information as part of the registration process. Any such information you provide must be accurate and up to date and you agree to inform us of any updates or changes to such information. (g) Before connecting to the APIs, you must register your Application and receive authentication credentials from MediaMath (such credentials, the “API Key”). The API Key will uniquely your Application when making API calls to the Service Platform. API Licensed Uses Subject to full compliance with these Terms, MediaMath hereby grants you a limited, non-sublicensable, non-transferable, nonexclusive, revocable license to access and use the API Materials. (a) You will only access (or attempt to access) an API by the methods described in the API Materials related that API. (b) MediaMath, in its sole discretion, will set a “call volume” for each API. Please see the API Material for the applicable API for the current call volume limits on the API services you use. You agree to promptly notify MediaMath in writing (via e-mail) if you believe you need to exceed the expected call volumes limits. MediaMath shall have no obligation to increase its call volume limitation to accommodate your request. © You and your use of the API Materials will comply with all applicable law, regulations and third party rights, including without limitation, laws regarding the import or export of data or software, privacy and federal and state laws. You will not use the APIs to promote or conduct illegal activity. (a) Sell, lease or sublicense the API or access thereto, including but not limited to, creating an Application that functions substantially similar to our API and offer it for use by third parties. (b) Obtain or use more than one (1) Access Code, either through one or multiple accounts. © Misrepresent or hide your identity, API Key or the login credential when using the API. (d) Modify, decompile, copy, translate, repurpose, repackage or reverse engineer the API or otherwise alter the API or attempt to extract the source code from any API in order to build any derivations of the API. (e) Use the API in a way that harms the interests of MediaMath or any of its affiliates, the API or the TerminalOne™ service platform (the “Service Platform”). (f) Misrepresent or falsely state your identity or relationship with MediaMath. (g) Introduce any viruses, worms, defects, malware or any item of a destructive nature to the APIs. (h) Acquire ownership of any rights in our APIs or the content that is accessed through our APIs by using the API Materials. (i) Use the APIs for any illegal, unauthorized or otherwise improper purposes, or in any manner that would violate these terms or any terms within the API Materials, or breach any laws or regulations, or violate any right s of third parties. Confidentiality (a) “Confidential Information” includes all information provided by MediaMath to you under these Terms, including without limitation, the API Materials, API Keys and the Access Codes. You will not use or disclose Confidential Information other than as required to perform under and permitted by these Terms and Agreement. Your confidentiality obligations will survive the termination of these Terms for two (2) years. The parties acknowledge that monetary damages may not be a sufficient remedy for unauthorized use or disclosure of Confidential Information and that MediaMath will be entitled (without waiving any other rights or emedies) to such injunctive or equitable relief as may be deemed proper by a court of competent jurisdiction. Term and Termination (a) Term. The Terms take effect on the date you accept them and will continue until either terminated as provided hereunder, or until your Master Services Agreement with MediaMath is terminated in accordance therewith. (b) Termination. This Agreement will terminate automatically without notice if you fail to comply with any of these Terms. The limited license that is granted hereunder is contingent on your compliance with these Terms and terminates automatically if you fail to comply with the Terms. MEDIAMATH RESERVES THE RIGHT TO TERMINATE THIS AGREEMENT OR SUSPEND OR DISCONTINUE YOUR ACCESS TO THE API MATERIALS, OR ANY PORTION OR FEATURE THEREOF, FOR ANY OR NO REASON AND AT ANY TIME WITH OR WITHOUT NOTICE TO YOU AND WITHOUT LIABILITY TO YOU. © If you wish to terminate this Agreement, you must email a termination notice to ; any other methods used by you to terminate the Agreement will not be effective. Your termination notice will be effective when MediaMath confirms receipt of your termination notice. (d) Effect of Termination. Upon the termination of this Agreement, your Access Codes will be revoked and all licenses granted hereunder will terminate. (e) Remedies. You acknowledge that your breach of these Terms may cause irreparable harm to MediaMath, the extent of which would be difficult to ascertain. Accordingly, you agree that, in addition to any other remedies to which MediaMath may be legally entitled, MediaMath shall have the right to seek immediate injunctive relief in the event of a breach of these Terms by you or any of your officers, employees, consultants or other representatives. (f) Survival. The following sections shall survive the termination of these Terms: 3, 4, 5, 6 and 7. Warranty, Liability and Indemnification (a) Disclaimer of Warranty. THE API MATERIALS AND ALL OTHER MEDIAMATH SERVICES ARE PROVIDED “AS IS” AND ON AN “AS-AVAILABLE” BASIS, WITHOUT WARRANTY OF ANY KIND, AND MEDIAMATH DISCLAIMS ALL WARRANTIES, WHETHER EXPRESS, IMPLIED, STATUTORY, OR OTHERWISE, INCLUDING WITHOUT LMITATION WARRANTIES OF MERCHANTABILITY, NONINFRINGEMENT, FITNESS FOR A PARTICULAR PURPOSE, AND ANY WARRANTIES OR CONDITIONS ARISING OUT OF COURSE OF DEALING OR USAGE OF TRADE. MEDIAMATH DOES NOT WARRANT THAT THE API MATERIALS OR ANY OTHER MEDIAMATH SERVICES PROVIDED HEREUNDER WILL MEET YOUR REQUIREMENTS OR THAT USE THEREOF WILL BE ERROR-FREE, UNINTERRUPTED, VIRUS-FREE, OR SECURE. (b) Limitation on Liability. THE API MATERIAL HEREIN IS PROVIDED FREE OF CHARGE. ACCORDINGLY, YOU AGREE THAT MEDIAMATH SHALL HAVE NO LIABILITY ARISING FROM OR BASED ON YOUR USE OF THE API MATERIALS. IN NO EVENT SHALL MEDIAMATH BE LIABLE TO YOU OR YOUR AFFILIATES FOR ANY INDIRECT, SPECIAL, INCIDENTAL, CONSEQUENTIAL OR PUNITIVE DAMAGES (INCLUDING, BUT NOT LIMITED DAMAGES FOR LOSS OF DATA, REVENUE, AND/OR PROFITS), WHETHER FORESEEABLE OR UNFORESEEABLE, ARISING OUT OF OR IN CONNECTION WITH THESE TERMS REGARDLESS OF WHETHER THE LIABILITY IS BASED ON BREACH OF CONTRACT, TORT, STRICT LIABILITY, BREACH OF WARRANTIES OR OTHERWISE, AND EVEN IF THE PARTY HAS BEEN ADVISED OF THE POSSIBILITY OF THOSE DAMAGES. MEDIAMATH’S LIABILITY UNDER THESE TERMS AND AGREEMENT SHALL NOT EXCEED ONE HUNDRED DOLLARS ($100). © Indemnification. You will indemnify, defend and hold harmless MediaMath and its affiliates, officers, directors, employees, agents, users and partners from and all claims, damages, losses, liabilities, actions, judgments, costs and expenses (including reasonable attorneys’ fees and costs) brought by a third party arising out of or in connection with: (i) your use of the API Materials other than as expressly allowed by these Terms, (ii) your breach of any terms hereunder and (iii) your gross negligence or willful misconduct. You may control the defense of the indemnified claim, including through choice of counsel, provided that MediaMath may appear at its own expense through its own counsel. You shall not acquiesce to any settlement that imposes any liability or substantive obligation on MediaMath without its prior written consent. Ownership (a) As between you and MediaMath, MediaMath owns all right, title and interest in and to the API Materials and the Service Platform and you shall own all right, title and interest in and to the Application. By using our APIs, you do not acquire ownership of any rights in our APIs or content accessed through our APIs. (b) Any feedback or suggestions about our APIs provided by you shall be the property of MediaMath, and nothing herein shall prevent MediaMath from using such feedback or suggestions. General Terms (a) No Agency. You acknowledge and agree that the relationship between you and MediaMath is that of independent contractors. Nothing in these Terms shall be construed as creating a partnership, contract of employment, agency, joint adventure or franchise relationship between MediaMath and you. (b) Governing Law. These Terms shall in all respect be governed by and construed in accordance with the laws of the State of New York without regard to any conflict of law principles. The sole and exclusive jurisdiction and venue for actions and disputes arising under these Terms will be the state and federal courts in the county of New York. © Assignment. You may not assign, sublicense, delegate or otherwise transfer the Terms or this Agreement or any right granted hereunder, in whole or in part, whether voluntarily or by operation of law, and any attempt to do any of the foregoing in violation of this provision will be void ab initio. MediaMath expressly reserves the right to assign these Terms and Agreement and to delegate any of its obligations hereunder. The Terms are binding on and inure to the benefit of each party hereto and their heirs, successors and permitted assigns. (d) Entire Agreement. The Terms constitute the entire agreement between you and MediaMath relating to the subject matter herein and supersedes any prior version of the Terms as well as all prior agreements (written or otherwise) and representations between you and MediaMath. No modification to the Terms will be binding, unless in writing and signed by an authorized MediaMath representative.